This week is World Reflexology Week (24 – 30 September 2018), where reflexologists all over the world are spreading the word. As those of you who have met me know I am passionate about reflexology and all the ways it may help people of all ages. It is very difficult to explain to people what it feels like, how you will feel during and after a session and the benefits, as everyone’s experience differs. Every week I receive a number of enquiries asking if reflexology can cure this, if it can help with that, if it will induce labour etc etc. As there has not been sufficient medical research into Reflexology and other Complementary Therapies to prove its effectiveness we cannot say that it will do all these things, so the best way to find out is to give it a go. What I love about my work is the variety of reasons people come to me. 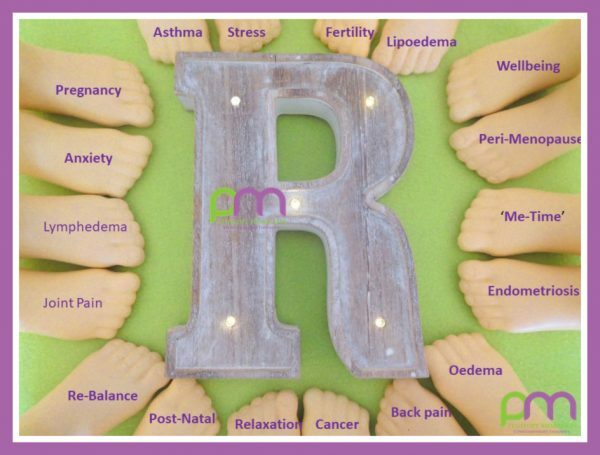 Just last week the age range of my clients was from 14 to 91 years and they came for all sorts of different reasons; anxiety, relaxation, fertility and pre-conception, pregnancy, circulation, lipoedema, to name just a few. And, everyone is different; some people like to chat throughout their sessions, others like to lie back and close their eyes, and others sleep for the whole 50 minutes. Likewise, there are a number of different reactions following the sessions; from sleepy, to energised, or feeling as if a weight has been lifted. If you haven’t tried reflexology with me yet, I offer taster sessions at my tranquil Garden Room in Hutton, Brentwood (CM13 2PP) and The Nesting Place in Chelmsford (CM1 7TG). These are 20 minute relaxation sessions for new clients to find out if reflexology is for them, for just £10. And for those of you who have already experienced reflexology with me, a big “thank you” for sharing your experiences with your friends and families, and for all the recommendations and Facebook and Google + testimonials.